Feeling generally inspired by Malign Portents, I threw together this thematic objective marker. 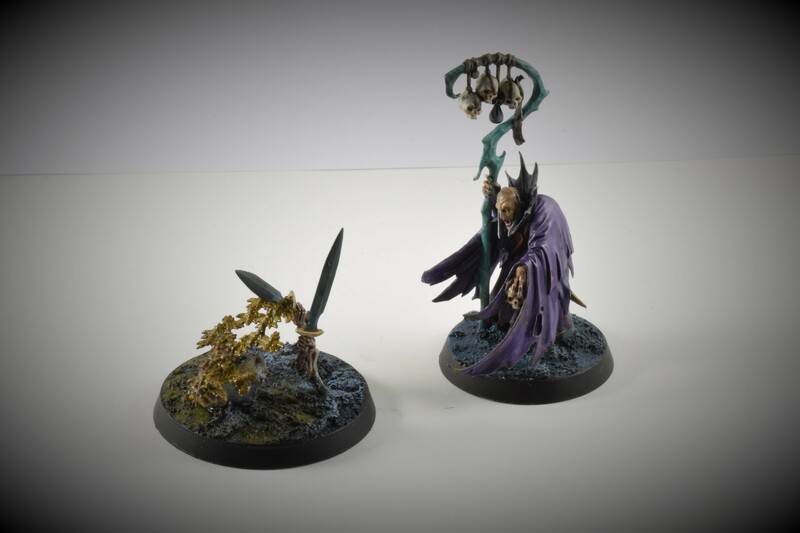 In the scene below Saskial, Necromancer of New Lahmia, stands in an opposing but similar situation, facing down the blight and effervescent rot of Nurgle by drawing upon the forces of the Realm of Death. This quick build involved a couple of spare arms from the Skeleton Warriors box, the swarm of Flitterflies from Nachobuddy’s Drycha Hamadreth, a rock from the Zombie Dragon kit, and a little green stuff to secure the arms to the base. The skeletal sections and base were done in my usual Death paint scheme. For the flies, I painted over a white basecoat with Nurgle’s Rot, followed by Typhus Corrosion, Cassandora Yellow, Nuln Oil and then a hint of Nurgle’s Rot to taste. Finally, I based the Nurgle half of the base in roughly the same way as my Blood Angels. Last day of the weekend before going back to work now, after a great break. It’s been productive for rejuvenating my thoughts, working on the blog and photography, and getting more painting done – my Grave Guard and Cairn Wraith will be up soon!